UNIVERSITY PARK – Penn State has lost an alumnus whose leadership and philanthropy have helped the University to become a pioneer in the life sciences. J. Lloyd Huck, the retired chairman of the board of pharmaceutical firm Merck & Company and a former chairman of Penn State’s Board of Trustees, died in State College this week at the age of 90. With his wife and fellow Class of 1943 member Dorothy Foehr Huck, he established endowments in fields ranging from molecular biology to nutrition, leading to the creation of the Huck Institutes of the Life Sciences. Lloyd Huck, who was born in Brooklyn, N.Y., interrupted his studies at Penn State to serve in World War II, and he completed his degree in 1946 as the only chemistry major in his class. After an early career as a research chemist with Hoffmann-La Roche, he rose through the ranks at Merck from a marketing manager post in Omaha, Neb., to become the company’s president and chairman of the board. The Hucks remained closely connected to their alma mater, taking on a wide range of volunteer roles. 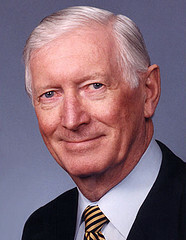 Lloyd chaired the Board of Trustees from 1988 to 1990, and he also served as president of the Penn State Alumni Association from 1975 to 1977. Lloyd Huck was among the first to recognize the increasingly important role that philanthropy would play in public higher education, and he led one of the University’s earliest private fundraising efforts in the 1980s to secure support for the Wartik Building, a facility dedicated to the life sciences. He was a member of the steering committee for the Grand Destiny campaign and a fundraising chair for Penn State Milton S. Hershey Medical Center. The Hucks have also led by example with their own philanthropy to Penn State. Their gifts and estate plans have benefited programs and projects across the University, including the Eberly College of Science, the College of Health and Human Development, Penn State Milton S. Hershey Medical Center, the Smeal College of Business, and University Libraries. The Hucks have been leading supporters of the Life Sciences Building, the Business Building and the Henderson Building projects at University Park and the Biotech Institute and Cancer Institute at Penn State Hershey. The Huck Institutes of the Life Sciences, an interdisciplinary consortium of faculty, students, and programs in seven Penn State colleges and schools, were named in their honor in 2002, the same year that they were recognized as the University’s Philanthropists of the Year. The Huck Life Sciences Building, named in 2012, celebrates their continuing commitment to the University. Lloyd received the Distinguished Alumnus award, the highest honor offered by Penn State to its graduates, in 1993. Lloyd is survived by his wife, Dottie; son Lloyd E. Huck; daughter Jeanne Leslie-Hughes; daughter Virginia Stalcup and her husband, Steven Stalcup; four grandchildren; and one great-granddaughter. A visitation will be held from 2 to 4 p.m. on Saturday, Dec. 22, at the Koch Funeral Home in State College. Memorial contributions can be made to the Department of Chemistry, The Pennsylvania State University, 116 Old Main, University Park, PA, 16802.